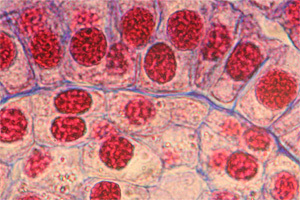 Stained nuclei of plant cells. Check if the optics deliver a crisp picture of high contrast. Is dust visible? Used microscopes can be a good investment, provided that one is aware of a range of different issues. Appropriate optics: Make sure that the microscope is equipped with the objectives that are needed for your task. Many microscopes from hospitals and research institutes are equipped with phase contrast or plan apochomatic objectives. These are expensive and not required for educational work. Are the focusing knobs easy to turn or has the lubrication oil already solidified? Do not force-turn the focus knobs, it will increase the wear on the gears. Does the condenser move freely up and down, or has the lubrication oil already solidified? Does the condenser stay up, or is it pulled downwards by its own weight? Does the iris diaphragm open and close without problems, or has the lubrication oil already solidified? Were the non-oil immersion objectives dipped into immersion oil? They are not designed for this. If the objectives are spring-loaded, does the front part of the objective retract properly when pushed in? Or was the objective covered completely with immersion oil, now solidified? Are there any fungi growing on the lens optics? This may be a problem of microscopes used in warm and humid areas. Does the stage stay where it is, or does it move down due to its own weight? Does the microscope generally make a good impression? If you want to equip a whole classroom with used (or new) microscopes, make sure that they are from the same series. Students are then confronted with the same device each time and do not have to re-learn the peculiarities of each instrument – more productive lab work. It also makes makes it easier for the teacher to explain the handling of the microscope. If you buy used instruments, then you may not be able to obtain a whole classroom set at once (unless another school, college or hospital replaces its equipment at once). Make sure that the used microscopes have the appropriate optics installed and not specialized objectives! You need achromatic bright-field objectives. Many research microscopes come with phase contrast objectives installed, however. This type of optics also can be made to work like bright-field objectives but they are more expensive and you don’t want to spend money on things that you don’t need. In recent years the so-called infinity optics became increasingly popular, especially in research. Be careful – infinity objectives are not compatible with the “traditional” DIN 160mm systems, and infinity optics from different manufacturers are also not compatible with each other. When purchasing infinity systems (if you can afford them…), be aware that the optics can possibly not be exchanged with other microscopes that you or your school owns.